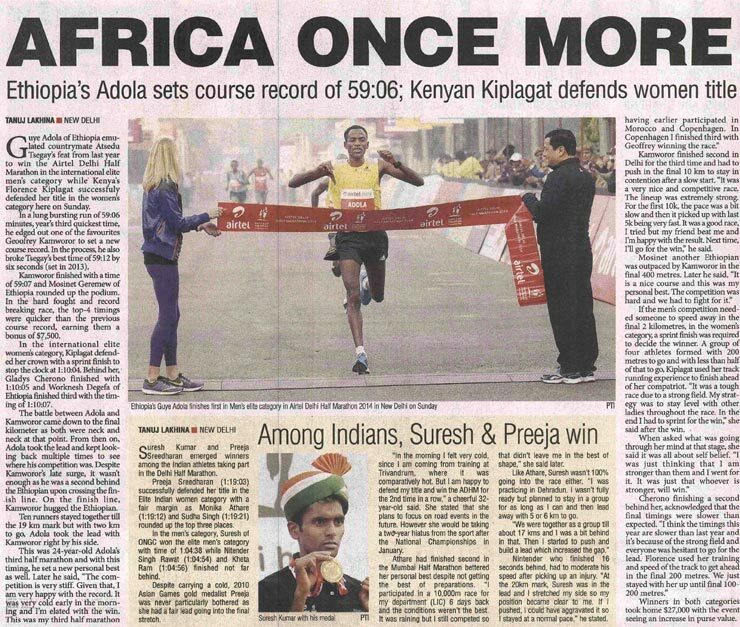 Guye Adola of Ethopia shattered the course record on his way of victory in a past-paced contest in the highly -competitive.. 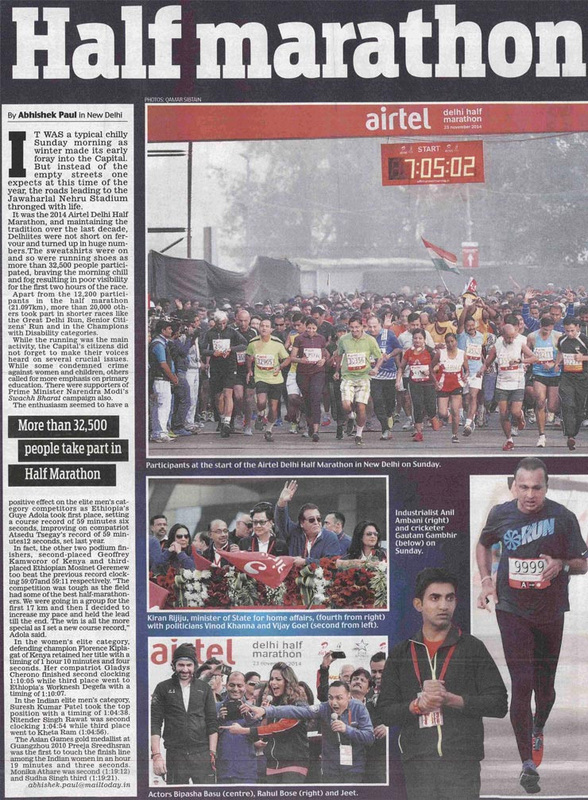 It was a typical chilly sunday morning as winter made its early forway into the capital. 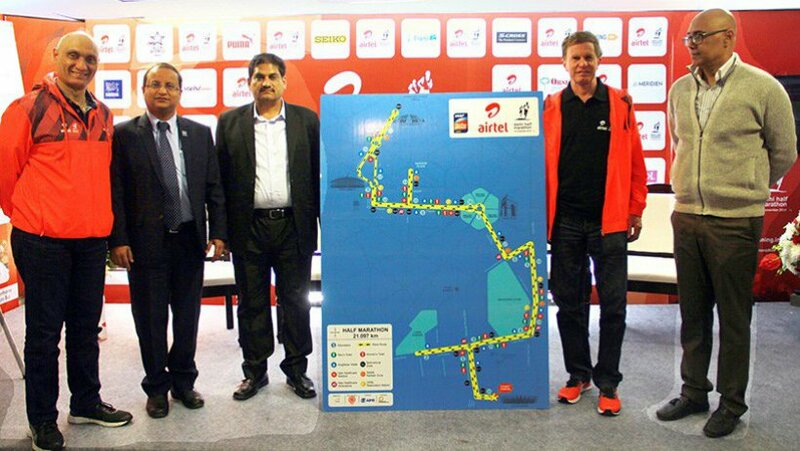 But instead of the empty streets one expects at this time of the year. 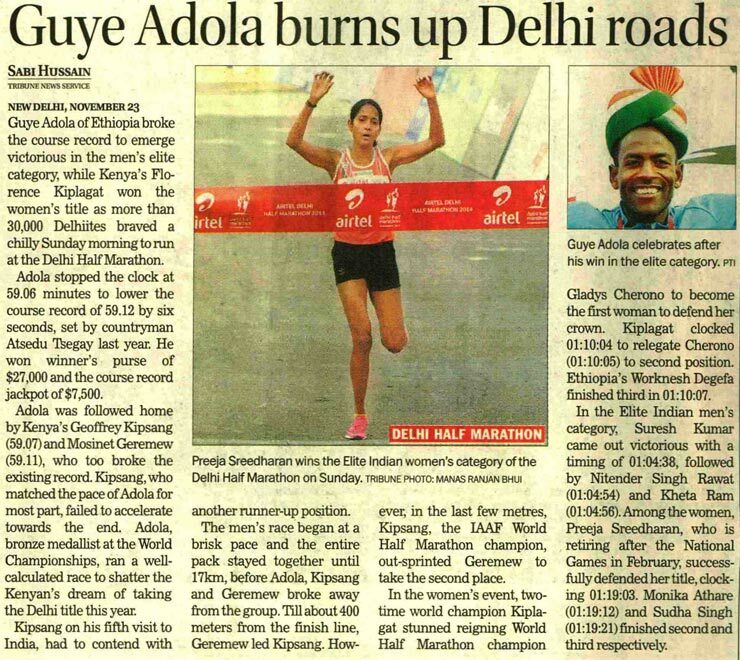 Ethiopia's Guye Adola hardly found a mention in the pre-race events.Given that there were at least six runners who had posted better timings than him. 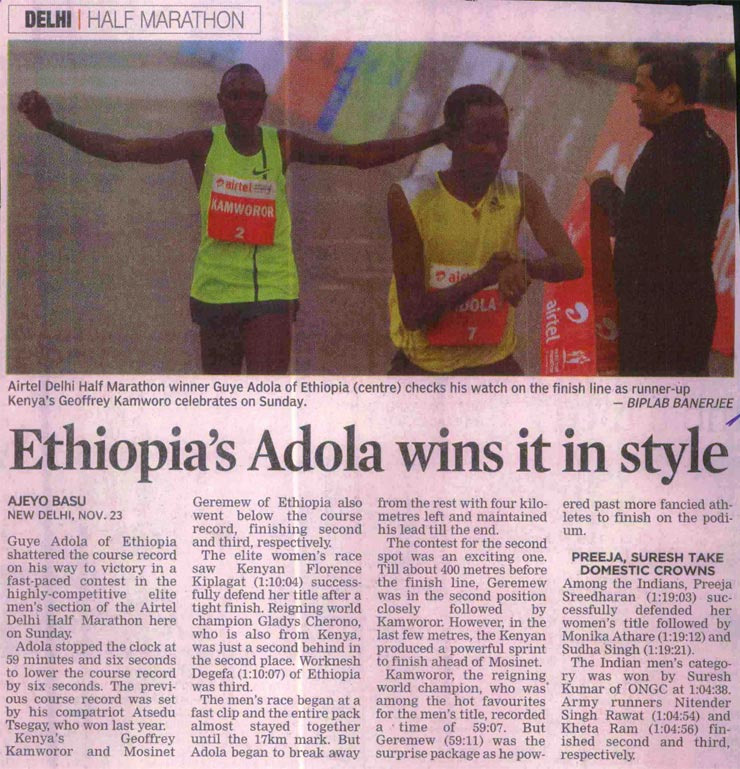 Guye Adola of Ethopia broke to emerge victorious in the men's elite category. 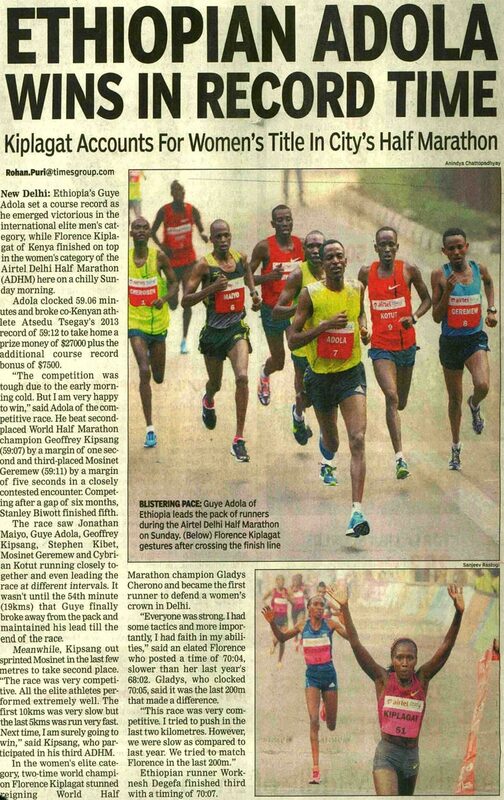 Ethiopia's guye set a course record as he emerged victorious in the international elite men' category, while Florence Kiplagat of Kenya finished on top in the women's category of the Airtel Delhi half Marathon (ADHM) here on a chilly sunday morning. 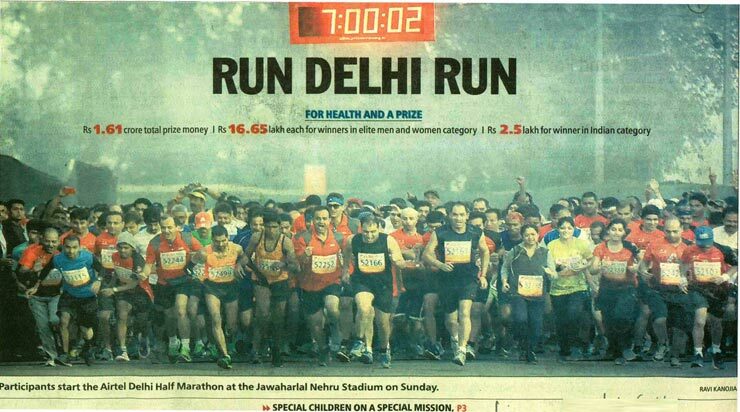 The success of any marathon depends on two crucial factors. 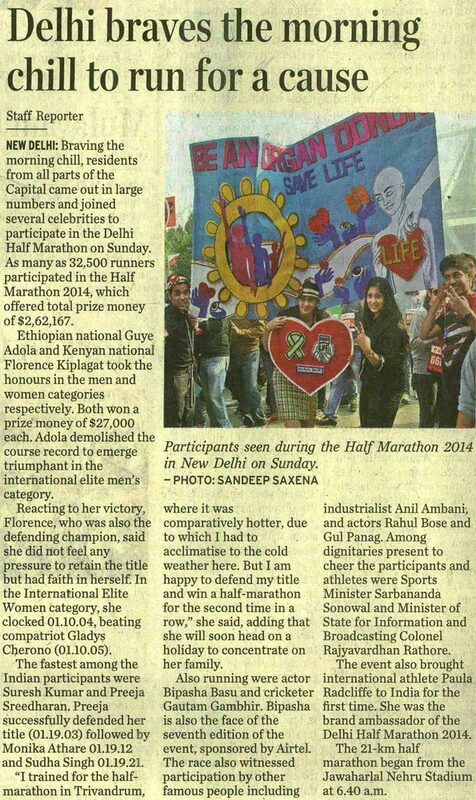 One, it must bring in the local flavour, and secondly the runners , the soul of any race, must support it by coming in good numbers. 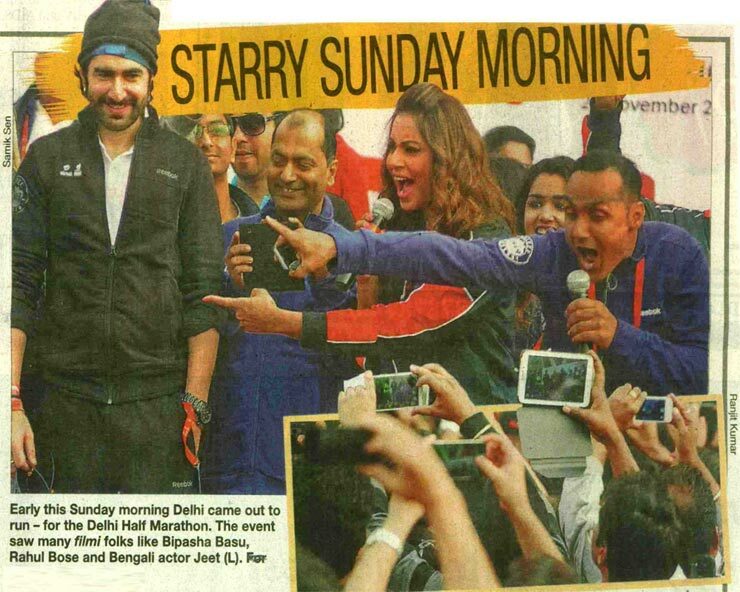 Early this sunday morning Delhi came out to run- for the Delhi Half Marathon. 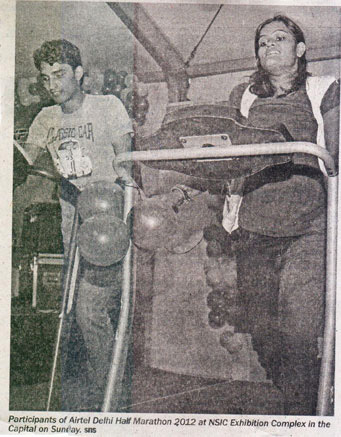 The event saw many filmi folks like Bipasha Basu, Rahul Bose and Bengali actor Jeet. 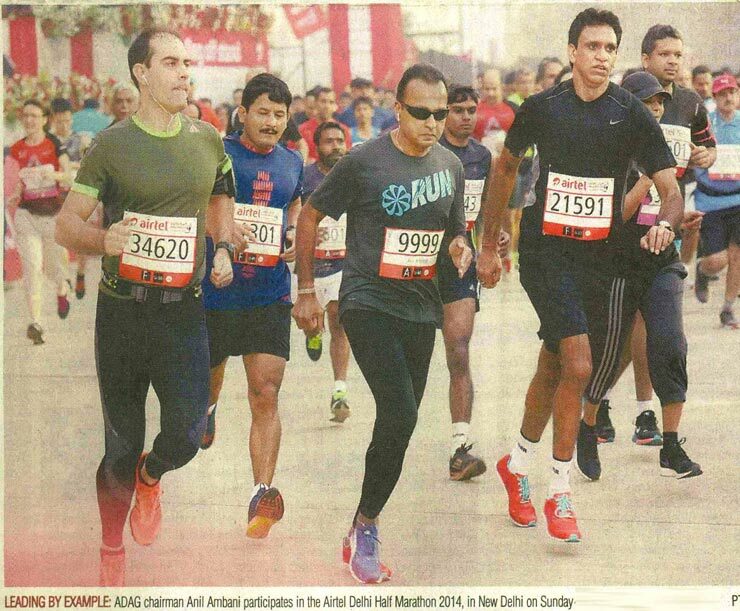 The prestigious Airtel Delhi Half Marathon got a shot in the arm as 1996 Atlanta Olympic gold medalist sprinter Donavan Baley joined the event as its ambassador for this edition. 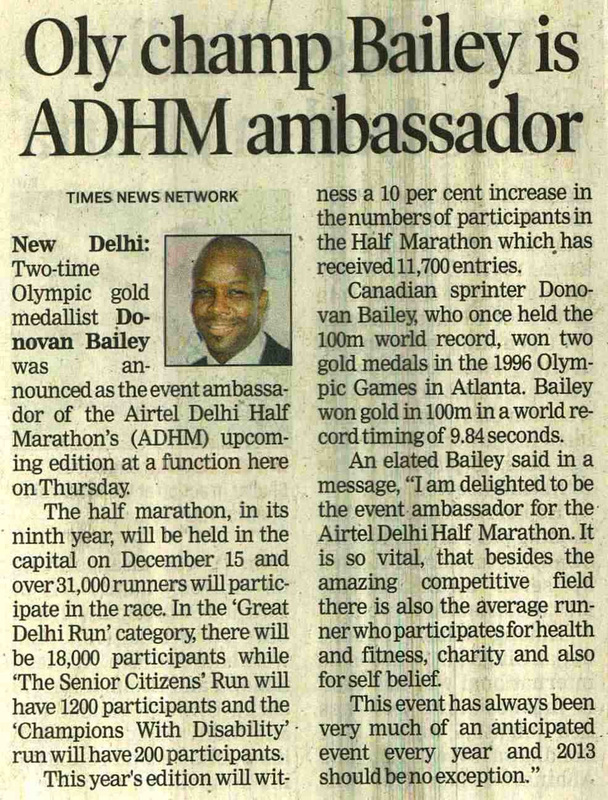 Atlanta Olympics 100m gold medalist Donovan Bailey, along with legend Milkha Singh, was on thrusday named the event ambassador for Airtel Delhi Half Marathon, slated for December 15. 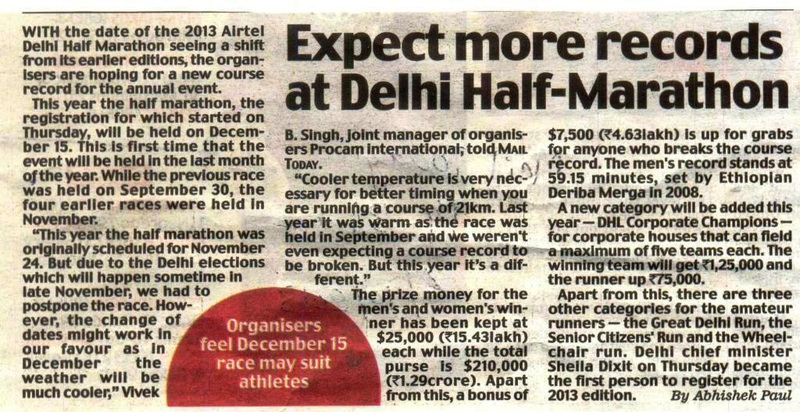 The capital city is gearing up to stage the 9th edition of the Airtel Delhi Half Marathon 2013, on December 15. 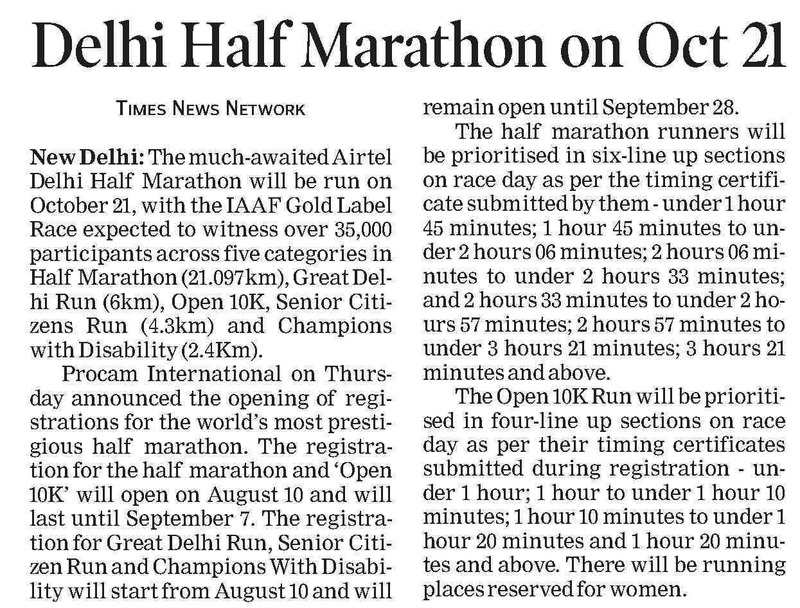 With the date of the 2013 Airtel Delhi Half Marathon seeing a shift from nits earlier editions, the organisers are hoping for a new course record for the annual event. 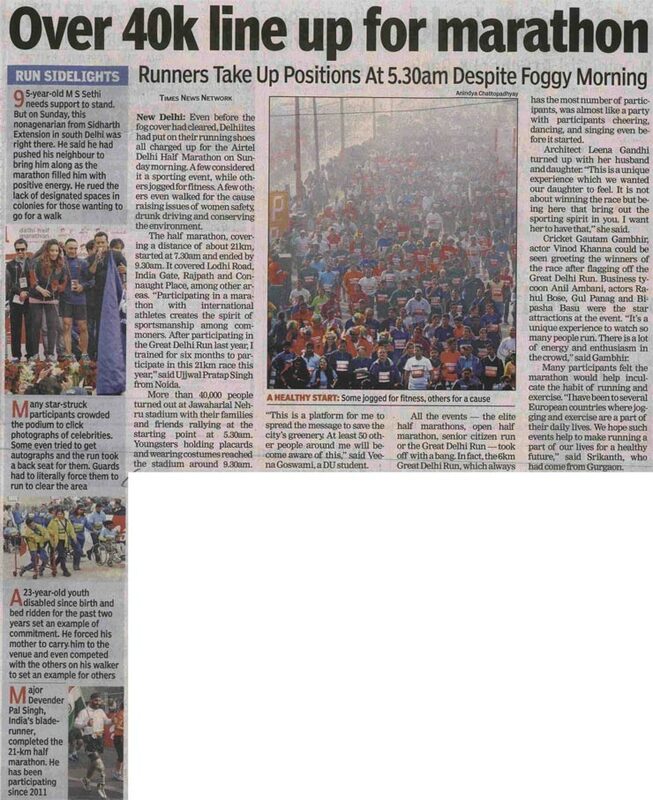 Bollywood star Bipasha Basu, a self confessed fitness freak, on thrusday exhorted women to participate in big numbers in the annual Airtel Delhi Half Marathon 2012 which will be held here in the capital on September 30. 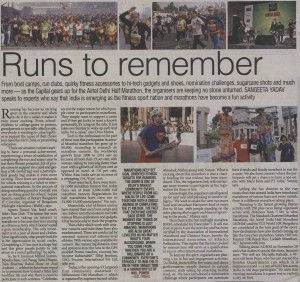 They love to make people run and promote the habit of running. 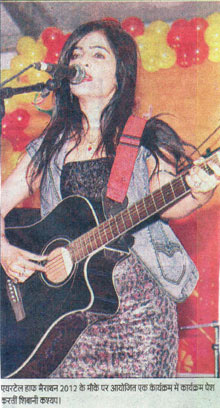 It does not matter whether it is bred as a passion or a tool to unwind oneself. 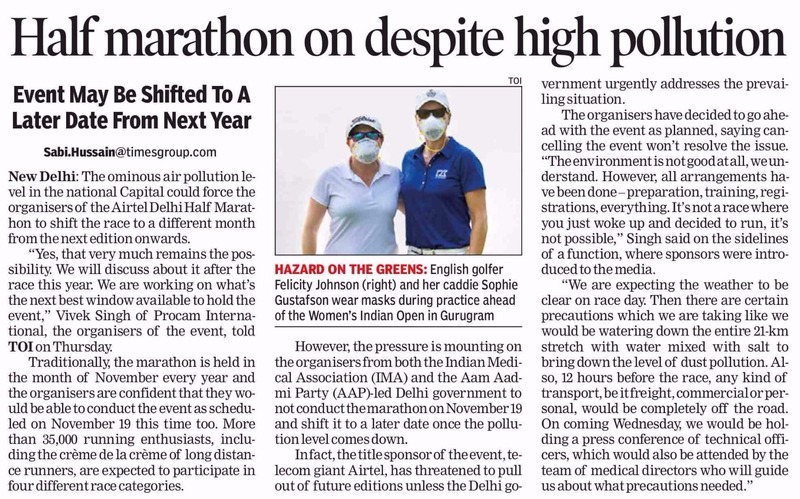 At least Rs 4 crore is expected to be raised for charity throung the 5th Airtel Delhi Half Marathon this year, Said Nidhi Singh, the director of the event's charity parter, Concern Indian Foundation. 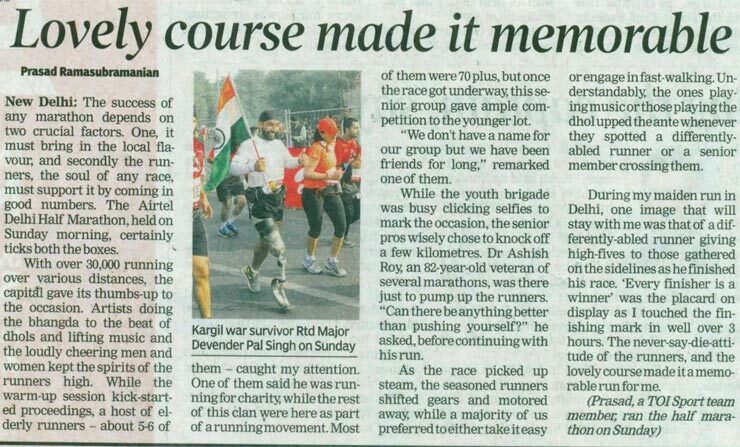 Mann Kaur, truly epitomises the maxium - age is just a number. 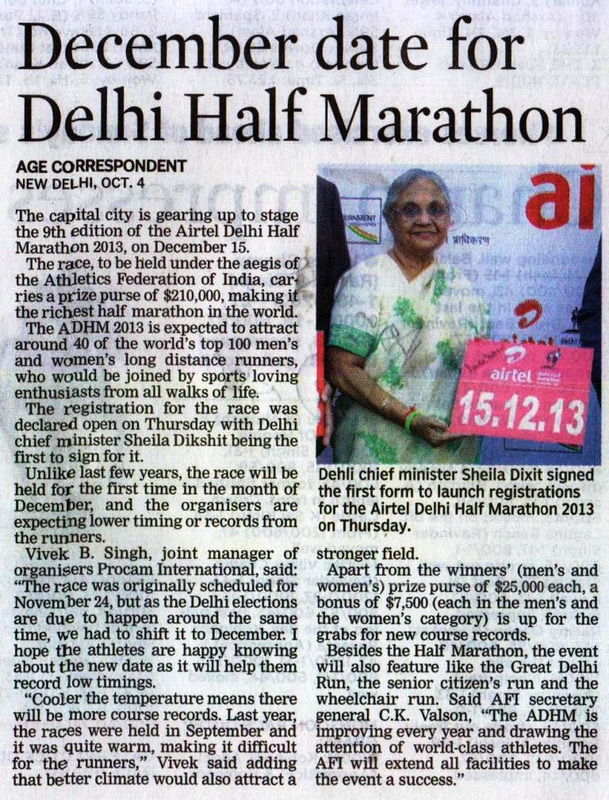 At the age of 96, she has defined all physical barriers and achieved the incredible title of an athlete. 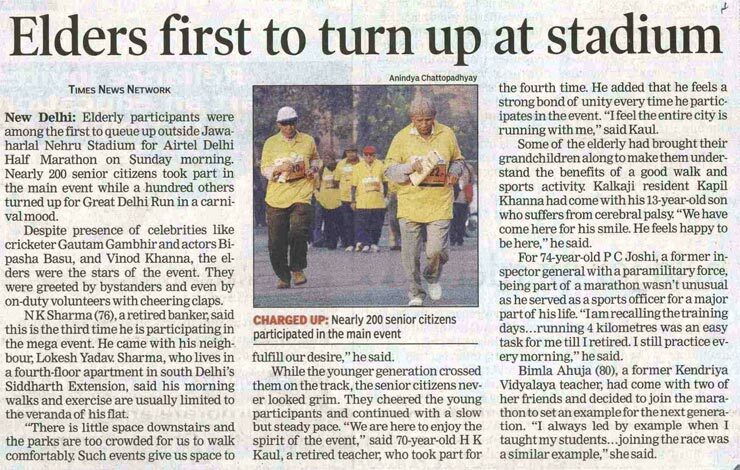 The Airtel Delhi Half Marathon will see a 96-year-old participant. 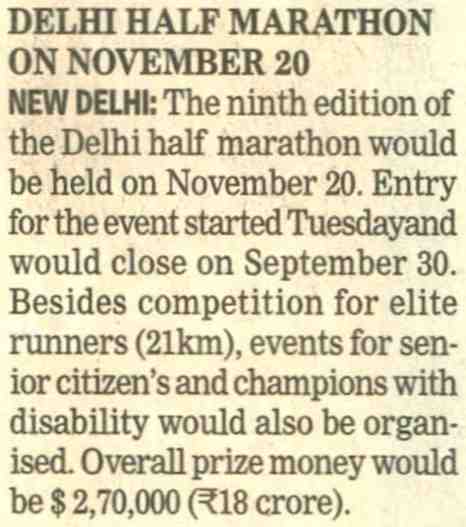 Mann Kaur, who will be the oldest runner in the event, officials said. 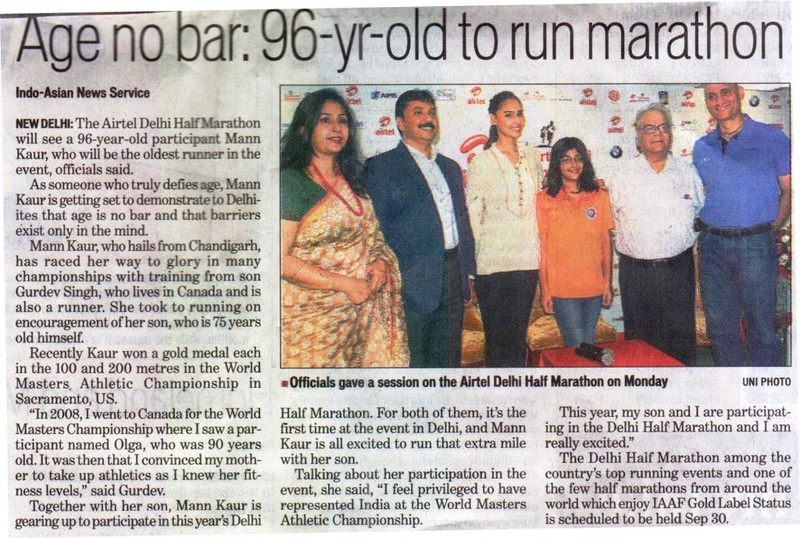 As someone who truly defies age, Mann Kaur is getting set to demonstrate to Delhiites that age is no bar and that barriers eist only in mind. 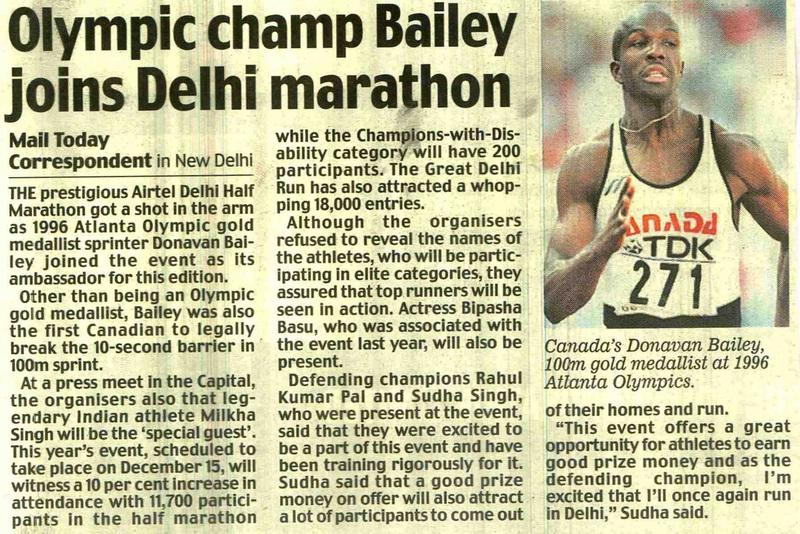 The BMW X5, the lead car for the Airtel Delhi Half Marathon 2012, was unvelied at the Active Expo in New Delhi on Friday.